In everyday life, the interference of light most commonly gives rise to easily observable effects when light impinges on a thin film of some transparent material. For instance, the brilliant colours seen in soap bubbles, in oil films floating on puddles of water, and in the feathers of a peacock's tail, are due to interference of this type. 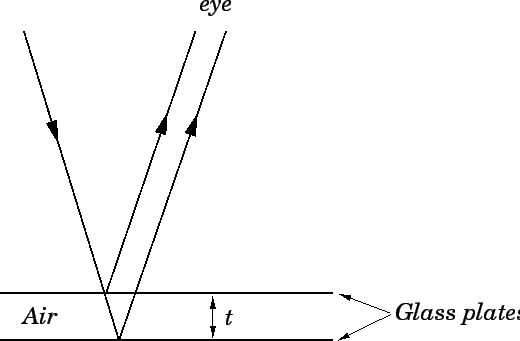 Suppose that a very thin film of air is trapped between two pieces of glass, as shown in Fig. 88. If monochromatic light (e.g., the yellow light from a sodium lamp) is incident almost normally to the film then some of the light is reflected from the interface between the bottom of the upper plate and the air, and some is reflected from the interface between the air and the top of the lower plate. The eye focuses these two parallel light beams at one spot on the retina. The two beams produce either destructive or constructive interference, depending on whether their path difference is equal to an odd or an even number of half-wavelengths, respectively. Figure 88: Interference of light due to a thin film of air trapped between two pieces of glass. For white light, the above criteria yield constructive interference for some wavelengths, and destructive interference for others. Thus, the light reflected back from the film exhibits those colours for which the constructive interference occurs.